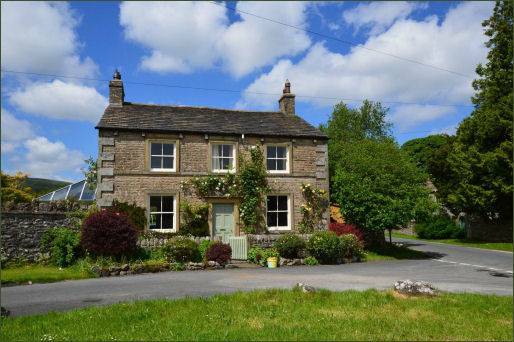 The picturesque small village of Arncliffe is situated in beautiful Littondale, beside Upper Wharfedale, and lies 3 miles from Kilnsey. 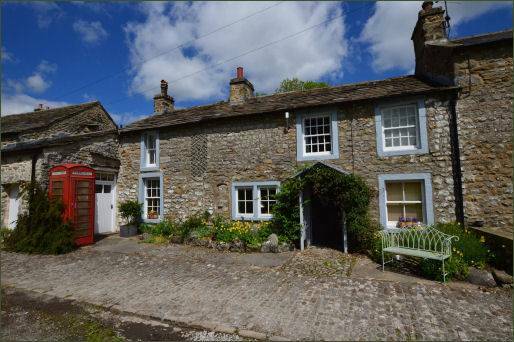 Arncliffe was first recorded in the Domesday Survey of 1086. The name is of Anglo-Saxon origin and means "eagles' cliff". 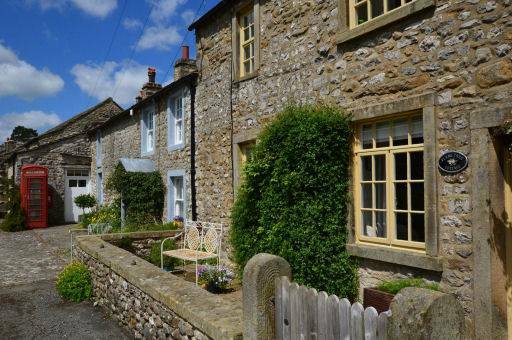 The village was the original setting for the fictional village of Beckindale in the ITV series Emmerdale Farm from 1972 to 1975, before filming the village scenes switched to Esholt. The village pub, the Falcon was the setting for the Woolpack Inn, while the village forge, shop, vicarage and church was to be used for the exterior scenes of those buildings in the series. 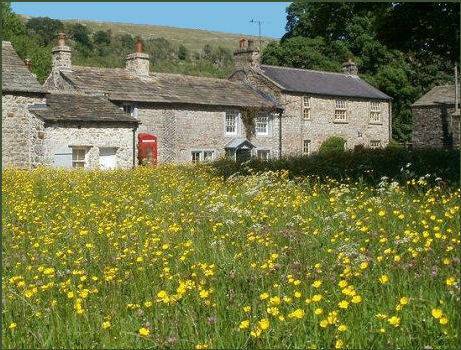 Beautiful Littondale, with its steep, rich green hillsides of open pasture and woods, crested by craggy outcrops and exposed moorland, is dotted with stone barns, some seventeenth century farmhouses and a number of shake holes and sink holes that lead to underground cave systems.The sheltered valley has been inhabited for over 5,000 years, it is rich in Bronze and Iron Age remains. Lynchets, cultivation terraces on the northern hillside, date back to Saxon times. The Norman conquerors used the area for hunting before granting it to the monks of Fountains Abbey for sheep farming, still a major use of the land. 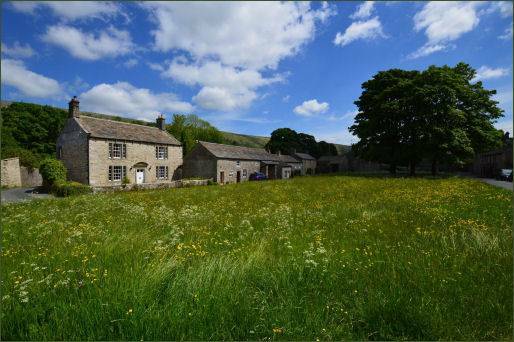 Arncliffe is set above the flood-plain of the River Skirfare, limestone cottages, farmhouses and other buildings face the large green, which is carpeted with wild flowers in the spring and summer months and hillsides etched with limestone scars. Behind the village buildings lie several small crofts, nearly one to each house, and beyond these, limestone walls climb the surrounding hills separating higher fields. The village church of St Oswald's lies close to the river a little to the north of the village. A Grade II listed building, the church dates to 1841, but stands on Norman foundations and retains a fifteenth century tower. 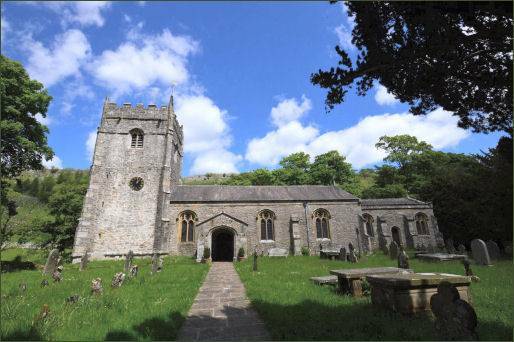 The first patrons of the church were the De Arches family, who were lords of Arncliffe under the Earls of Northumberland. Patronage passed through the Percy family and Henry, second Earl of Northumberland, transferred patronage to University College, Oxford, in 1442/5. Inside is a soldier's pike and an illuminated list of the Men of Littondale who fought at the Battle of Flodden Field in 1513. 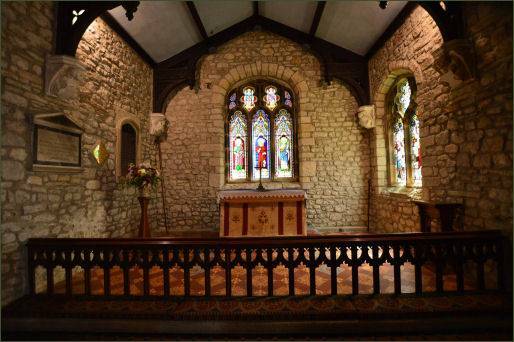 Stained glass windows in the church are mostly Victorian, including representations of Oswald, patron of Arncliffe, and Michael, patron of Hubberholme. The glass of the east window is by William Wailes of Newcastle. 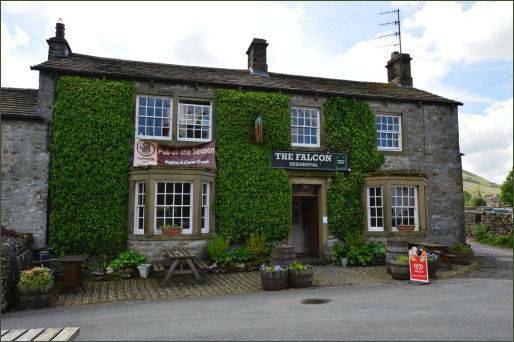 The village is now a Conservation Area, and the local pub, the Falcon, which provides accommodation and serves good home cooked food, the pub still uses the traditional beer to jug, jug to glass, method of serving ale. 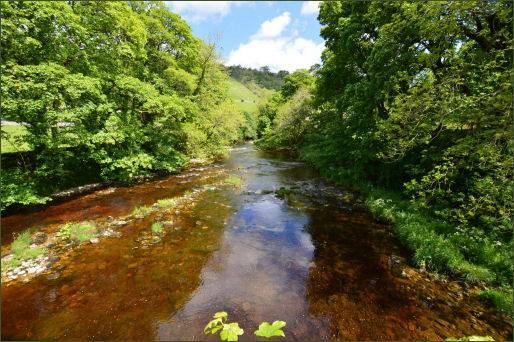 The Falcon also has four miles of its own private fly fishing on the River Skirfare. 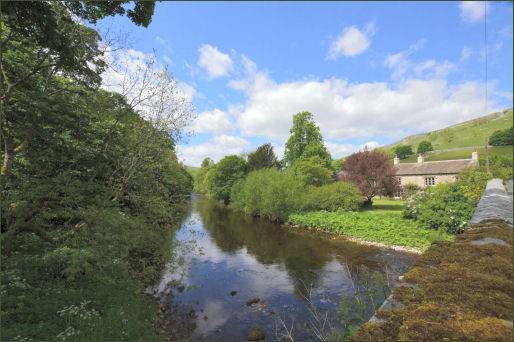 The road up the dale crosses the river past Bridge End where Charles Kingsley once stayed and wrote part of Water Babies and Old Cotes, built in 1650, whose gabled porch has a 3-light window somewhat characteristic of late seventeenth century houses in this area of the dales. 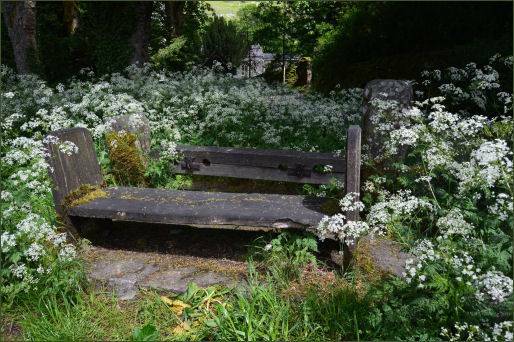 The poet William Wordsworth also visited Littondale and composed about it in the White Doe of Rylstone. A narrow, winding road climbs steeply southwards from the village, across the fells towards Malham. 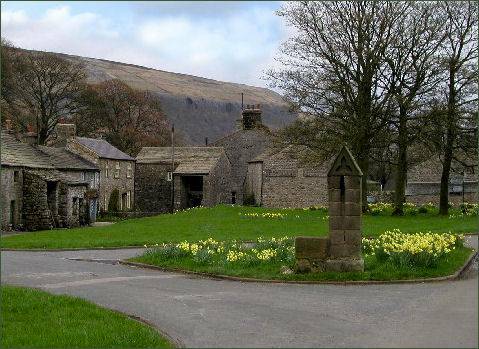 Paths also lead to Kettlewell and Starbotton.